← WARNING: Are These 5 Home Staging No-No’s Sabotaging the Sale of Your House? I ran across your website and really liked what I saw so I thought I would write in to get your opinion. I’ll be getting married in the spring and want to sell my condo soon so we can start our new life together in a new house. I think I need to replace my old Formica countertops in the kitchen before listing with an agent because they are dated (silver and gold flecks) and do have some corner damage that can’t be repaired. My fiancé wants to save the money for the wedding and doesn’t think upgrading to granite would be worth it. My question is this; If I make the investment and spring for granite countertops, will I get my money back? First of all, congratulations on your wedding plans! That must be very exciting and I wish you both the best! As far as the countertop is concerned, I am going to have to give you a two-part answer here. 1) If the countertop is damaged, it definitely needs to be replaced. If not replaced, your condo would need to be priced accordingly. The problem with not replacing it however, is that most potential buyers don’t really want to do the work themselves and are typically in the market for move-in ready. So even if you lower the price to accommodate, you are more likely to still end up with low-ball offers and possibly losing some potential offers, altogether. I would definitely remove that hurdle upfront by having the countertops replaced. 2) In reference to updating to granite, you don’t really say anything about the asking price or condition of your property or the condition of other comparable properties in the area, so I would do a little research. If similar condos have granite, then it would be well worth it to keep up with the Jones’. 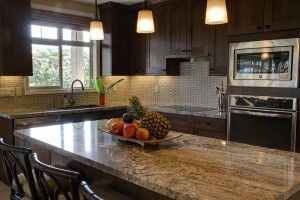 And certainly if they don’t, granite countertops might ultimately give you an edge in that marketplace. In that case, I would again price accordingly by including the price of the new countertops in your bottom line. If the rest of the condo is in great condition and you are the only one in the area with granite, people are often looking for and/or willing to pay more for the upgrades, so I think you will definitely get your money back through both the listing price and shorter time on the market. Regardless of what you decide, I do want to caution that when you replace and/or upgrade the countertops, please do make sure your cabinets are in excellent condition, as well. Shiny new counters…especially a higher-end countertop like granite…slapped on top of dated old cabinets makes those cabinets stick out like a sore thumb and just serves to highlight how awful they really are. So clean them up, replace the hardware, re-stain and/or paint the cabinetry for a little boost and those new countertops will fit right in! Hope this helps, and congrats again on your upcoming nuptials! This entry was posted in Home Staging Tips and tagged house countertops, staging counter tops, staging countertop, staging countertops, update countertops. Bookmark the permalink.